It’s not like I have a shortage of things to write about – it’s more a matter of having enough spare time! I happened upon this piece at a local book store while I was ooh-ing and aaah-ing and pawing at the journals. It grabbed my attention. I leafed through its pages and chuckled at some of the writing prompts. I acted on impulse and bought it – along with a few journals, of course. The purchase decision may have been influenced by a subconscious response to a recent question from a writing friend. This lovely person is reading my novel and complimented me on it so far (yay!) and asked me what else I am working on. Hmmm. Not much except the occasional deep blonde observation on life, lifestyles and other people’s children’s social behaviour. Other than that, I haven’t written anything worth the time and tears it takes to share via traditional publishing. If ever I run out of ideas, I know where to turn. 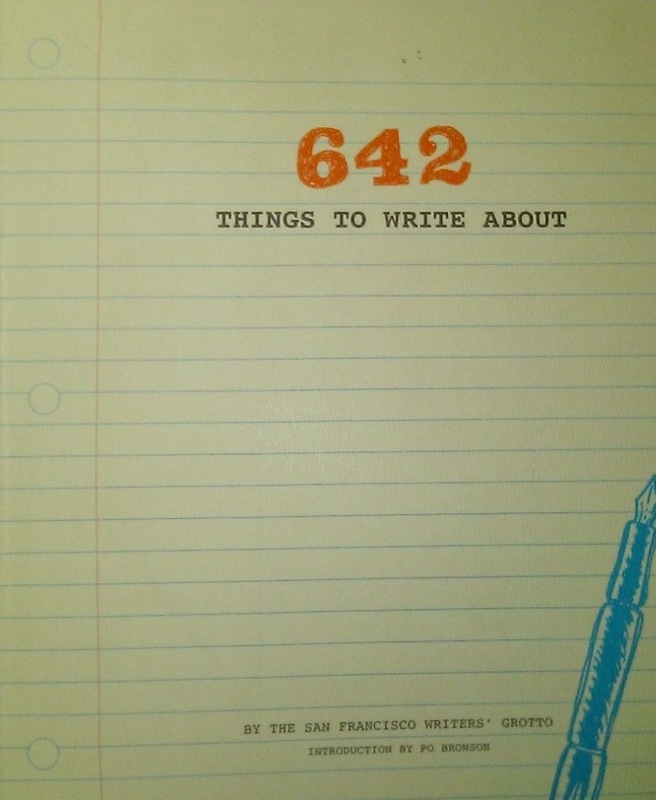 Apparently, they have another book out already titled “712 MORE things to write about”. Goodness gracious! If you’re looking for some bittersweet Canadian fiction, you can get a taste by downloading a sample of The Year of the Rabbit ebook from Smashwords. Hop on over to the Facebook page and give it a like. If you happen to read the entire book, please submit a wee review or add to the readers’ comments. Flo will be tickled pink. You know how it is. You sort through boxes of clothing, pulling out the warmer, long-sleeved tops and corduroy pants. You look at outfits that you haven’t worn for over two years but you keep transferring them each season. Although you don’t follow many trends, you figure that some are just not stylish any more. You notice that some have suffered shrinkage after being pushed to one side of the closet or placed in that under-the-bed box. It’s an unexplained phenomenon. They go to a bag for the local charity delivery. There! That feels better. At least with the cooler temperatures of approaching autumn and (gasp!) winter, those pretty young women with firm, tanned limbs will have to cover up. Rejoice, middle-aged women. You regain an advantage by sharing your experience and wisdom in conversations with eligible men. Although at this stage of life, you still need those sleeveless tops to cope with the occasional hot flash. 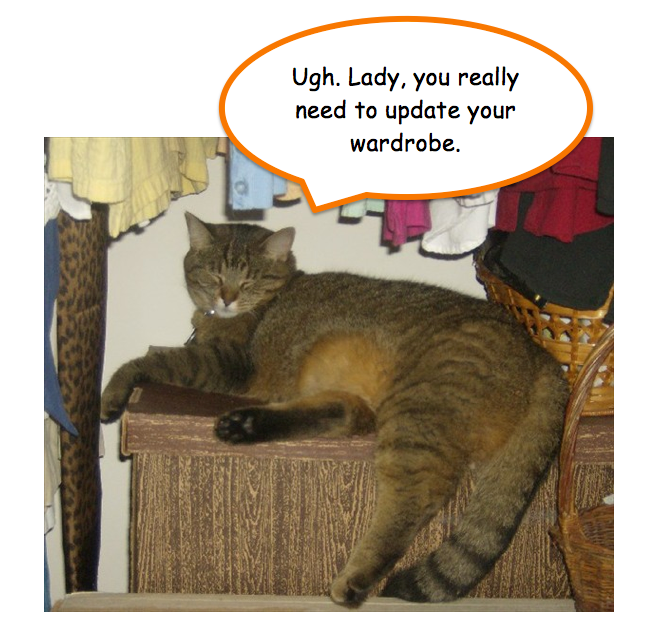 The Opinionated Tabby Cat is encouraging me to get some retail therapy. I shall comply, discount coupons in hand and stored up with the energy required for sweaty changing room disappointments. Thanks for dropping by. I hope your wardrobe upgrade quests are successful.